Gear Review! Philips Citiscapes Uptown - Crazy Wicked Awesome! If you aren’t an audiophile, I’ll break that down into easy to understand layman’s terms! Closed headphones are sealed off from the world and allow better sound isolation so you hear your music and not the rest of the world. Which is totally the point of headphones in my opinion. Open headphones are less isolated but usually offer more accurate sound reproduction. Personally I’m an advocate of closed headphones everywhere but in the studio/quiet home. In the few weeks that I’ve been using them the Uptowns are pretty great for cutting out unwanted noise, even when my music is at lower volumes which is awesome, because no one wants hearing loss. I was kind of expecting Philips’ Musicseal thing to be branding hype but, nope. It wasn’t just a gimmick. These cans had very little leakage into the outside world even at higher volumes I was the only one hearing my music! Next up we’ve got the frequency response! simply put, sound travels in waves, and these waves vary in frequency. Since the average human, and by average I mean with perfect hearing can only hear with in the range of 20 to 20 thousand hertz any pair of headphones with a range higher than this is really just bragging. Before you get all upset that you can’t hear the frequencies your cans are blasting, I’m going to point out that .mp3 compression works by cutting out the sounds you can’t hear anyway, so no matter how good your headphones are, they’re only as good as the sound you pump in them! However many people claim to hear a difference. Build quality is pretty excellent with one exception that I’ll touch on later… the ear cups are solid, and cleanly slide up and down easily, yet stay in place when you find the position that fits you. the headband is comfy with plenty of padding and lightweight and the ear pads are solid and have a nice give to them. Downside number two is the the microphone/volume slider bit. for one thing, it’s independent of your device volume, which actually works out better than I thought it would, especially on older media players. but it’s hard to find a middle ground between maxed out and super quiet because the thing is just so finicky. the Mic could also be a lot better. It’s very crackly and full of static, so it’s useful in a pinch but otherwise kinda pointless. 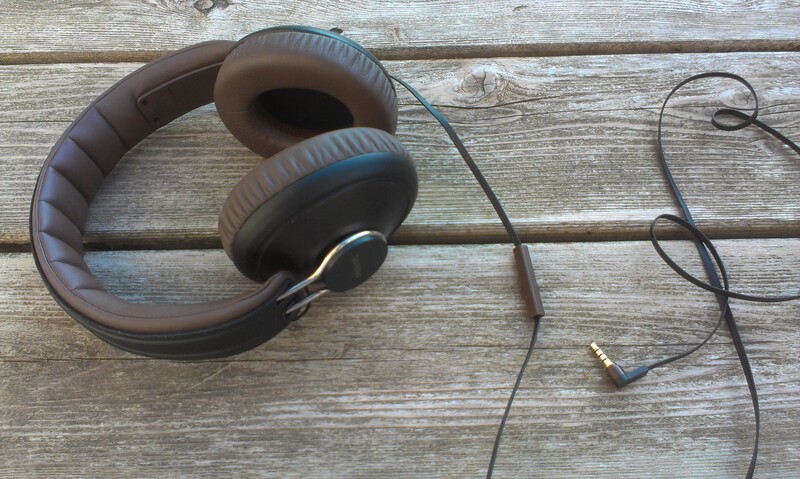 Overall I give the Philips Citiscapes Uptown Headphones a 8.5/10! Great sound, decent price, awesome comfort and style are taken down a notch thanks to a cable that does not deserve to be attached to such a nice pair of cans. If you like the uptowns and you like me please purchase them through my amazon affiliate link.